Amfie is ActionScript Remoting for EE. 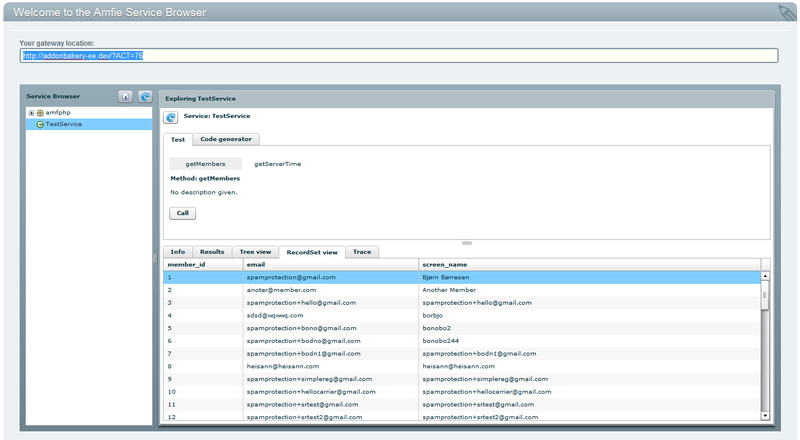 Create services which lets you use everything EE provides from sessions and memberships to content management. Amfie is built on AMFPHP and lets you easily connect your EE install to Flash, Adobe Flex or AIR applications. The AMF protocol is a lot more efficient than using XML in EE templates. Click the “Amfie” in the modules list to get to the service browser, and then replace whatever you get in the dialog that pops up with the URL it says in the "Your gateway location:" at the top. Amfie comes with a service browser that will find all services location in the system/expressionengine/third_party/amfie_services/ folder. Create a new class there, and it becomes an Amfie service. Add a new method to your class and it's a service method. That's pretty simple, huh? To create a new service, just create a class that extends AmfieService and you can access $this->EE and do what you need.